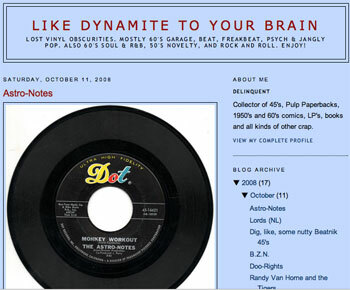 If you like a bit of beat, psych and garage, you might just like the Like Dynamite to your Brain blog. It claims to be dedicated to ‘Lost vinyl obscurities. Mostly 60’s Garage, Beat, Freakbeat, Psych & Jangly Pop. Also 60’s Soul & R&B, 50’s novelty, and rock and roll’. And it doesn’t just talk about them – the tracks themselves are there in MP3 format. One to add to your blog reader, you’ll find it via the link below.